The eating habits of the UK has dramatically changed over the last decade or so, and the usual favourites of pizza, fish and chips and curry have been usurped by a new Asian invasion led by one of my personal favourites, Thai. The reason for its popularity is that is combines exquisite taste with a degree of healthiness. Balance, detail and variety are of paramount significance for all Thai chefs, and what I love so much about Thai food is that although the dishes appear simple, they are in fact highly complex. This complexity takes the form of at least three, and more likely four or five fundamental taste senses in each dish, and the art is how the sour, sweet, salty, bitter and spicy flavours are mixed together to create that killer dish. Combined with this taste mixture you also get the other senses stimulated with the texture and colour explosions on the plate. I always think a testament to a restaurant’s quality is its longevity, and Busaba Eathai opened its first branch in Soho in 1999, and now 18 years on, there are eleven restaurants in and around London, with further restaurants planned. Busaba is named after a Thai flower, and I won’t insult you by saying what Eathai is a fusion of (think what you do in a Thai restaurant!! ), and its philosophy is one I like of a more casual dining venue with a menu devised to feed you with minimal fuss. Eating should be an enjoyable experience, and that should not only include the food but also the décor, location and the service, and I can see why Busaba has thrived as I just loved the restaurant in Kingston. Kingston is on the River Thames, and just a stone’s throw from the main shopping area is a delightful terrace running along the bank which is where you will find Busaba Eathai. Each restaurant contains intrinsic sensory elements which are designed to welcome guests and create a congenial atmosphere in which to eat, so there are tranquil water features with floating candles and gerbera flowers, and the aura senses are also stimulated as lemongrass incense fills the air. The wall to ceiling glass windows at the Kingston restaurant also brings the outside in and inside out, creating a feeling that you are dining on the Thames despite being in the warmth of the main restaurant, and follows the traditional Buddist value of Sookjal, helping you to avoid the chaos of everyday life. Thai cuisine is one of the most popular cuisine’s in the world, and in 2011, seven of Thailand’s popular dishes, more than any other country, appeared on the list of the “World’s 50 Most Delicious Foods in a worldwide online poll. They were: Tom Yam Goong, Pad Thai, Som Tam, Massaman Curry, Green Curry, Thai Fried Rice and Moo Nam Tok, and all of these can be found on the menu. On our visit, I initially selected one of Busaba’s signature dishes Thai Calamari, ginger and peppercorn (£7.75), and loved the contrast between the crispy glaze and the slightly chewy squid, all encased with a slight curry heat. My wife chose Chicken Satay with peanut sauce (£6.25), where a slightly crispy exterior encased succulent and moist chicken. The second course was much harder to choose as the selection is wider, with dishes from the Bangkok Char-Grill including Tamarind Grilled Duck (£15.50) and Green Curried Grilled Chicken (£11.95), which almost tempted us, but my wife chose the Chicken Butternut Squash Stirfry with cashew nuts and dried chilli (£8.95), and I went for another of Bushaba’s favourites, the Massaman Duck Curry (£11.95). The chicken and butternut squash certainly has a kick to it, but this heat complements the fleshy butternut squash and goes perfectly with the cooling coconut rice (£3.50). I loved this slight deviation of a classic massaman curry, with the thick rich sauce, as it didn’t have too much heat, and it had a lovely hint of hoisin which complemented the duck, and this went perfectly with a classic Pad Thai (£9.50), which had just enough sweetness without being sickly. When looking at the desserts the Asian continent is renown for having very sweet, almost sickly offerings, but here the dishes are sweet but also very tasty. I plumped for the Salted Caramel Chocolate Slice with strawberry coulis (£6.50,) which combined a crunchy chocolate biscuit base with a smooth moreish chocolate ganache. My wife opted for the Banana Fritters (£5.95) where a light crispy batter encased soft fresh banana. Busaba has continued to keep itself at the forefront of this Thai revolution by providing good food in relaxing environments, and continues to develop dishes which will keep it there for many years to come. When I hear the name Villandry it always makes me think of grand houses in France, so imagine my surprise when investigating this review, that I find that is exactly what it actually is, and is named after Chateau de Villandry in the Loire Valley that is renown for having the largest walled vegetable garden in France. Villandry has three very different restaurants at present, two in London and one in Bicester Shopping Village in Oxford, and my wife and I visited Villandry St James's, near to Pall Mall, on a Sunday lunchtime in February, and rather than having the place to ourselves there was an incredible buzz from the many diners who were availing themselves of the unlimited Prosecco Weekend Brunch (£35), which has proved extremely popular. 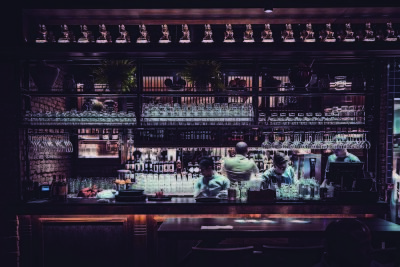 The St James restaurant is situated on the corner of upmarket Waterloo Place and Pall Mall in an area known for having some of the most impressive architectural buildings in London. The restaurant is split level with the lower level set out in a café style and the other a more stylish art deco restaurant boasting 1970’s style lamps that I know my parents would love. Both levels have soaring ceilings and are bathed in a warm light from the impressively large windows, making it a perfect location to while away a couple of hours with fine wine and good food. Indeed,Villandry’s purpose is to provide its diners with delicious quality food, ‘fait maison’, at affordable prices with a light and sunny style, in comfortable casual Grand Café surroundings, and these surroundings are certainly ‘Grand’. Villandry opens at 7am for breakfast, providing a dazzling array of breakfast fare, and at another time I will surely come back, but as it was lunch time I focused my attention on the lunch and dinner menu which is equally appealing. The starters are what you would expect from a high class French café/bistro, with Spiced Squid with fresh chillis and harissa mayonnaise (£11) and Dressed Crab (£11.50), but my choice was the Salt and Pepper Squid (£11), which had thin and crispy strips of squid accompanied by a lovely homemade crunchy tartare sauce. My wife fancied two of the mains so asked if they could do a starter portion of the Seasonal Risotto, and like the good restaurant that they are, their kitchen was able to accommodate the request. Risotto on the face of it appears easy to cook, as it is just rice with a few additional ingredients, right? Wrong, risotto, although simple, is actually very hard to do properly, but our portion made us wish that we had just had the larger main portion as the rich and moist mushrooms complemented the just crisp rice to give us a perfect risotto. The main courses are equally enticing and I wanted something I wouldn’t normally choose but that would satisfy my hunger. I scanned the menu and there was only one choice, a Smoked Haddock and Wester Ross Salmon Fishcake with Salmorejo sauce, spinach herb and tomato relish (£16), with a side of Villandry Aspen chips (£6.50), which were light and crispy chips tossed with parmesan and white truffle oil. When I cut through the fabulously crispy outer shell I was rewarded with flaky white haddock interlaced with pink salmon, and the tomato relish was refreshing. This was accompanied with crispy fries subtly flavoured with truffle oil and Parmesan cheese. Truly marvellous! My wife opted for the Villandry Burger with cheddar cheese on a sourdough bun served with salsa and chips (£14), and I think this must be one of the best burgers she or I have had. The meat was well-seasoned and so succulent that the juices seeped out into the bun making it delightfully gooey. A little difficult to eat genteelly, but perfect on your taste buds. Villandry also doesn’t disappoint with its dessert offerings, with Irish Coffee Crème Brulee (£6.50), very tempting, but my wife selected the Warm Chocolate Fondant (£7.50), which was a bundle of rich chocolate fudge joy, and I plumped for the Villandry Pudding Platter (£11), which offered a small piece of a number of desserts. This was nice, but I realised that although I got to taste a mouthful of a number of the desserts, in many cases that wasn’t enough, so no more hedging my bets in future and I will just select one. 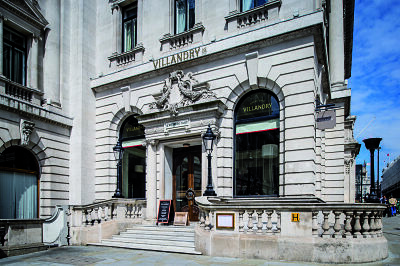 Villandry has an extensive wine list, as you would expect, which caters for all tastes and budgets, and as mentioned it has an unlimited prosecco weekend brunch offering, where staff ensure your glass stays full for the whole two hours. This offer includes a select choice of offerings from the breakfast and dinner menus as well as a cake platter and choices of pastries. As well as prosecco there is unlimited tea, coffee and orange juice. Other special offers include a steak night on Friday (£20), three small plates and a bottle of prosecco for (£26), or two beers for (£18.50), Monday to Saturday between 5 and 7pm, and on Monday you can celebrate the start of the week with Lobster Night where you can get a whole fresh lobster with chips and salad for £24. Villandry St James's is a super place to meet up with friends and enjoy good food and fine wine which matches the palatial surroundings, and don’t forget the pastries/cakes as they are totally moreish. Nestled amongst the shops, cafés and businesses of busy Notting Hill High Street is an Italian restaurant, unremarkable in appearance, named ‘Tentazioni’. The restaurant is small and intimate, with simple, comfortable furnishings. The addition of some intriguing pieces of art (all works from the same artist) adorning the walls, makes for a definite talking point if conversation is running dry! The restaurant is owned by Riccardo Giacomini, who took over in 1997 at the original Tentazioni in Bermondsey. Riccardo is also the chef. Authentic Italian cuisine is his passion, and seemingly it runs through his blood; as we hear from the waiter a brief history of Riccardo’s time training in the grand hotels of Italy before making the move to London. Tentazioni translates as ‘temptations’. This seems entirely appropriate as we are faced with a menu that offers a real challenge when it comes to making a decision. To begin we are served a trio of ‘amuse bouches’ from the chef; bite sized morsels of deliciousness - the prefect way to kick start the meal. In the end, I chose a Sardinian Organic Salad starter, whilst my partner opted for the Soup of the day which was an Italian onion soup. The salad was a delicious combination of fregola (a traditional Sardinian pasta) with roasted peppers, sun-dried tomato and thin slices of carasau; a thin, crispy, Sardinian flat bread. It had been explained to us that Riccardo cooks all dishes fresh to order; nothing is reheated, or pre-made, and our empty plates were testament to the quality and flavour of the dishes. The onion soup was among the best my partner had ever tasted, and having sampled a little, I had to agree. Keeping with Italian tradition, we followed our starter with a pasta course. My partner followed the recommendation of the waiter and opted for the Tagliatelle Tentazioni: Fresh Egg Tagliatelle with creamy black truffle sauce. I was tempted by the lobster tagliatelle from the‘Specials’. It’s been a while since I have eaten home-made pasta- knocking up a quick pasta with pesto is a staple meal in our house, and takes around 25 minutes from start to finish - but having the ‘real deal’ is quite another experience entirely! The taste and texture of the pasta is quite different from the dried, bagged variety I am so used to. The delicate sweetness of the lobster provided the perfect accompaniment. Knowing that there was another course to follow, I couldn’t manage the generous portion, but my partner gave a sterling effort, and found his tagliatelle with black truffle sauce absolutely worthy of its signature dish status. For the next course, I chose Seabass, served with sautéed potatoes and salad. My partner opted for the ‘Fritto Misto’, a selection of battered fish and seafood served with house fries. It certainly proved a test of our stamina, being again so generous in portion size, but the delicate flavours and freshness of the ingredients were too great a temptation, urging us to eat just a little more, and we did. The break between courses, as dishes are being freshly prepared, is a welcome chance to appreciate what has been eaten and enjoy the contemplation of what is to come, along with some great conversation of course. In this case, it allowed us the chance to decide that yes, after all, we could manage a dessert! We shared a ‘Tiramisu’, a firm favourite of both of ours, but once again we were delighted by just how different Tentazioni’s Tiramisu is from the alternative version offered by chain restaurants and supermarkets. Incomparable. I am now officially a tiramisu snob! As you’d expect, Tentazioni, offers a full wine list with the perfect accompaniments to Riccardo’s dishes. We enjoyed the house red to complement our meal. I imagine that If you had stepped off the high street by chance into this ‘unremarkable’ looking restaurant, you would be delighted to discover the ‘remarkable’ cuisine within. Tentazioni remains true to authentic Italian cooking, in a way that leaves many so-called Italian restaurants as nothing more than a nod to the country and its cuisine.